The most awaited week of the US tennis tournament tour schedule is finally here. The 2013 Tennis US Open begins August 26th. The best tennis players of the world come together and leave everything on the court to grab the victory that can only be claimed by one. And, Do it Tennis wants to celebrate with all tennis fans. Are you one of these excited tennis fans? Tennis is full of interesting, and maybe even surprising facts. Test yourself and figure out how much you know about the sport that you love. Start building up your reputation as an “expert tennis fan” and surprise your family and friends with those little secrets about the tennis sport! 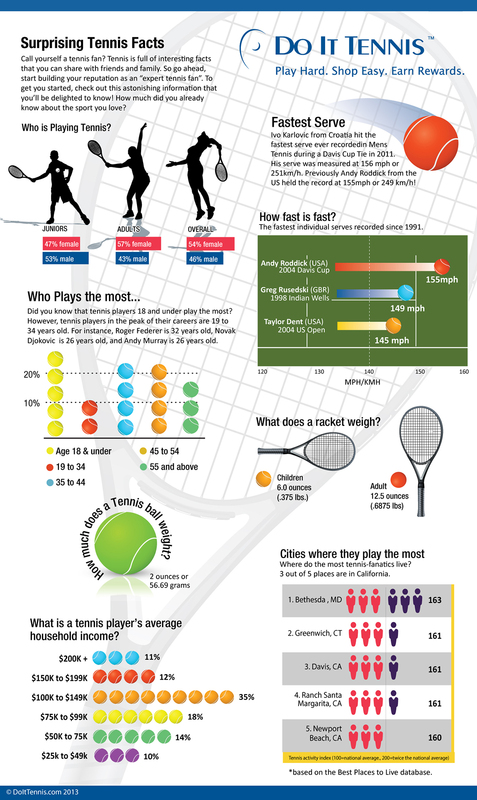 Enjoy more tennis off the court with these surprising tennis facts by Do it Tennis. Summer is not over yet, and the euphoria of the game heats up the atmosphere even more. The 2013 US Open is here! To celebrate the 2013 US Open, Do It Tennis is giving away three amazing prizes in the Do It Tennis Sweepstakes inspired on these three incredible players: Rafael Nadal, Novak Djokovic and Roger Federer. But wait women, DIT has something special for you tennis ladies, too! Check out the Do It Tennis Summer Sweepstakes!